Prepare Your Eyes for Soft and Cute Awesomeness! I made a dice bag for my DiceMasters game. 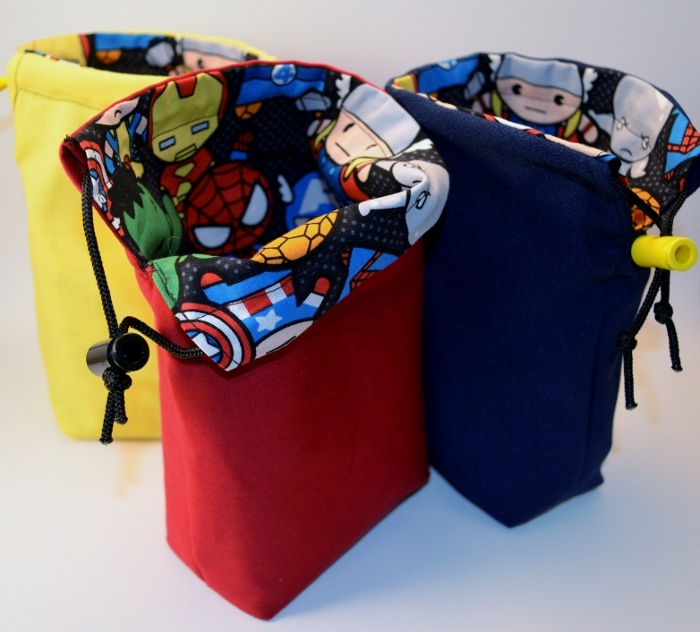 Now I can make dice bags because why not? I thought it was time to play with fabric for a while. Is there a medium I wont try? Molten Lead, I have to draw the line somewhere and that seems like a good one. They’re reversible too so I can play around with that too. Best of all for DiceMasters the bag stands on its own even when empty. 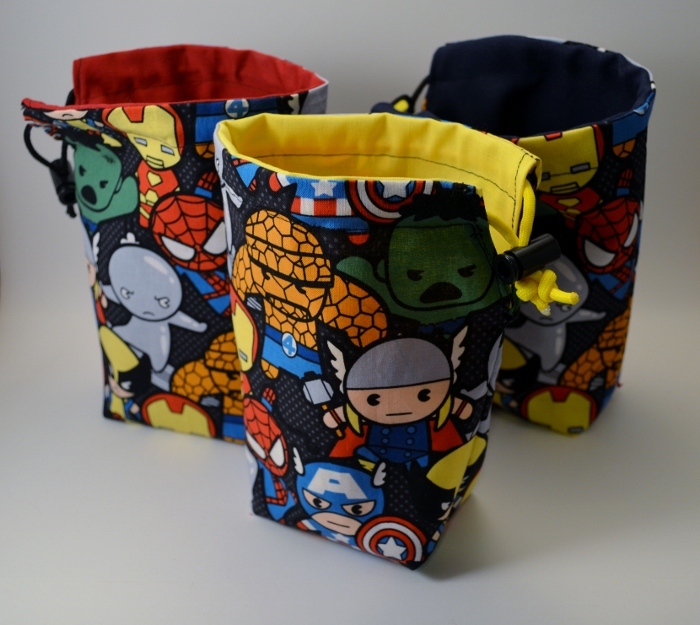 If you have the hardware needed to make a dice bag and want to make a dice bag but have limited sewing skills the check Tiffany Teaches. Her step-by-step guide was all I needed for making these. Thank you Tiffany! You rock. The fabric is Chibi kawaii Super Hero. Before I can properly introduce the project, I do need to say a few words about myself. I am a mother, college student, and part time worker at the bookstore of my school. In my spare time, I like to geek out and work on other projects that interest me. When I become impassioned about a project I can work on it until my mind turns to mush! I am absolutely in love with the Victorian Era. I have been dying to own my own authentic gowns, but I’ve never had the money to buy them. They are very expensive and rightly so. I discovered a love for sewing and conquered my fear of the sewing machine, so I’m putting together this project so I can finally own a Victorian Era gown. Other than the fact that I love the Victorian Era, the other major influence for choosing a Victorian gown is the fact that it can be broken down into these six smaller projects. As a beginning seamstress, it’s very important not to rush anything and bite off more than you can chew. 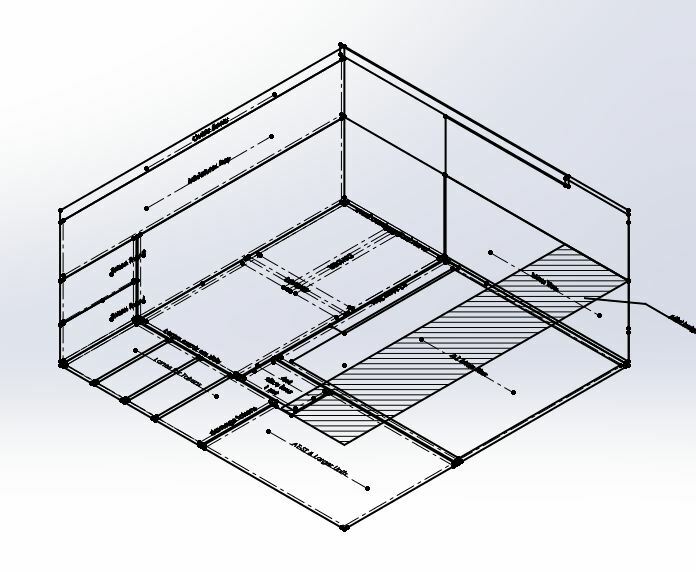 This allows for skills to be built slowly over the course of the entire project. That comes out to be one fine achievement! In my personal opinion, this is also a great way to build the skills you need to create other dresses, regardless of if they’re from past eras or the modern era. Before selecting this project, I was very set on sewing a wedding dress by hand, but had no idea where to start and I realized a wedding dress may not be the best project to start out on. The Victorian Gown, in theory, would help me build the skills I need to be able to tackle the wedding gown later. 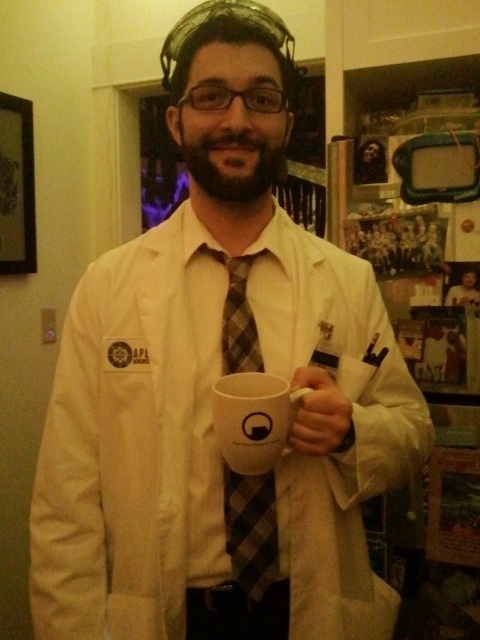 During the college years I did manage to find some time to throw together some costumes. The following are a few of the costumes that were finished enough to see the dark of night during a Halloween gathering. This costume came into being because I had just bought Sara a new sewing machine and figured I should tackle a project to see what I could do with the new toy. I purchased a Star Trek the Original Series pattern from Katarra8 on Etsy since it was said to be the easier to follow pattern according to a few posts I found on a great Star Trek costumes forum starfleet1701st.yuku.com/. Fabric was purchased from Micheal’s, a cutting wheel was added to the project (Those things are amazing) and I had played with the sewing machine enough that I felt confident in sewing both straight and curving lines. I am not naturally gifted in the ways of fabric. Its confusing. All the straight lines make perfect sense until you hit a curve, like those that connect the shoulder sections to the chest and suddenly you’ve sewn a section in a manner that had one section of fabric come up 3 inches short and you sitting there just playing WTF on repeat in your head. Knowing how to fit curves and add tension to the fabric at the right time is something that will definitely plague me for the next few projects. I’m a super newbie to this craft so I try not to get to discouraged but after you’ve ripped a seam for the 3rd time it makes it hard not to throw it into the fire pit and roast a couple of marshmallows off of it. 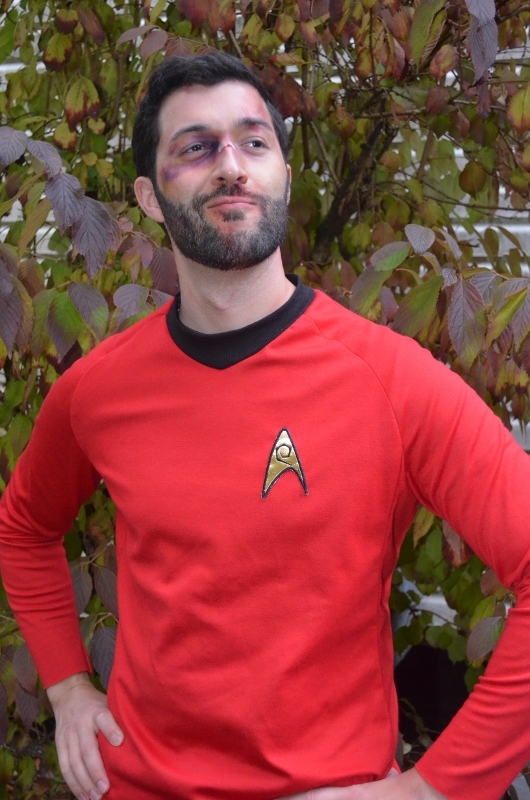 Stefan as a Red Shirt (Start Trek) Survivor. 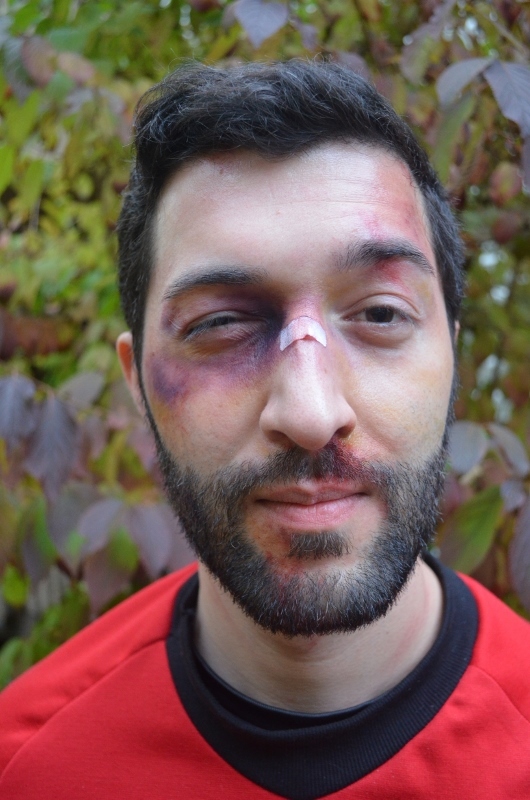 Since I was playing off of the idea that I was a Redshirt that was sent of in one of the more active away missions I wanted to play around with a little bit of fight effects makeup. I went to my local costume shop and picked up some of the better quality makeups they had. I got my start by watching a few videos on Youtube to get an idea of the right products to buy and proper blending techniques, like THIS video. I know I did well at this because during lunch at my companies Halloween gathering I found out that there was a rumor that most of the people outside of my team thought I had gotten into a car accident the evening before. After having just thoroughly enjoyed the game Portal and being a back in the day fan of Halflife I wanted to pay tribute to the hard working scientists from Aperture Science. 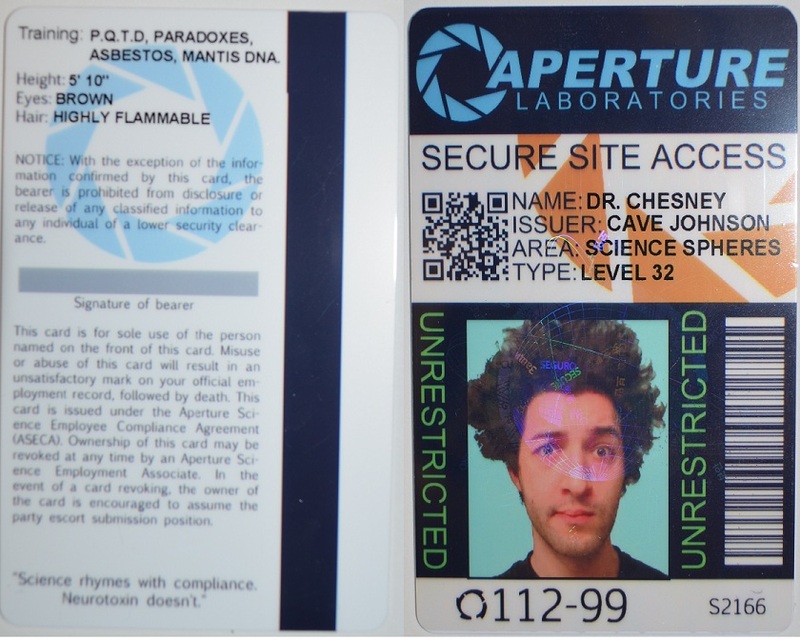 This was a pretty simple task, buy a lab coat, obtain a company logo, get a custom security badge made, some random props and accessories and look smart. Check and check. 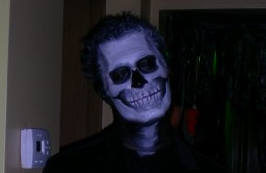 Likely my all time most rushed costume ever was a simple makeup application so I would look like a skeleton in a low lit room. Got the cheapest junk Halloween $1 makeup from my local grocery store. 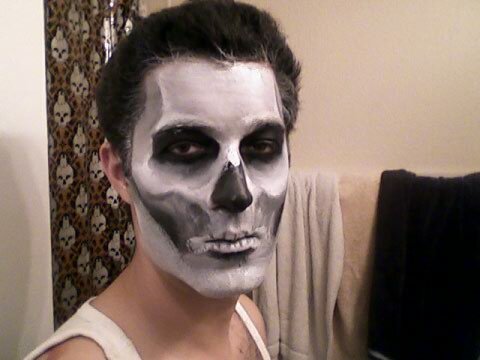 Found some Dia De Muertos face paint images but figured I wouldn’t have time to get those right so i just found a couple of skull images on my laptop, got some cotton swaps and sat in front of the mirror until I figured it out. It did take two attempts to figure it out at about one hour minimum per attempt. Here’s Trial one where I was still figuring out the layout before dealing with blending and details. There was this manga called I Luv Halloween created by Benjamin Roman. I really like the main character’s, Finch, look so I figured I’d see if I could try my hand at clay modeling and mold making. This was one of my more ambitious projects that I only gave myself a few weeks to throw together. That amount of time was far from what I needed. The mask came together well enough. The clay I selected was one that would harden nicely in the oven. The idea that I would have the time or money to make a mold from this while juggling college was no well thought out. The mold never happened and I was left with a very heavy mask that I had to make a wire mesh helmet to hold the weight. Its was heavy and overall very uncomfortable. On top of that I was never able to locate the orange wig to complete the look. 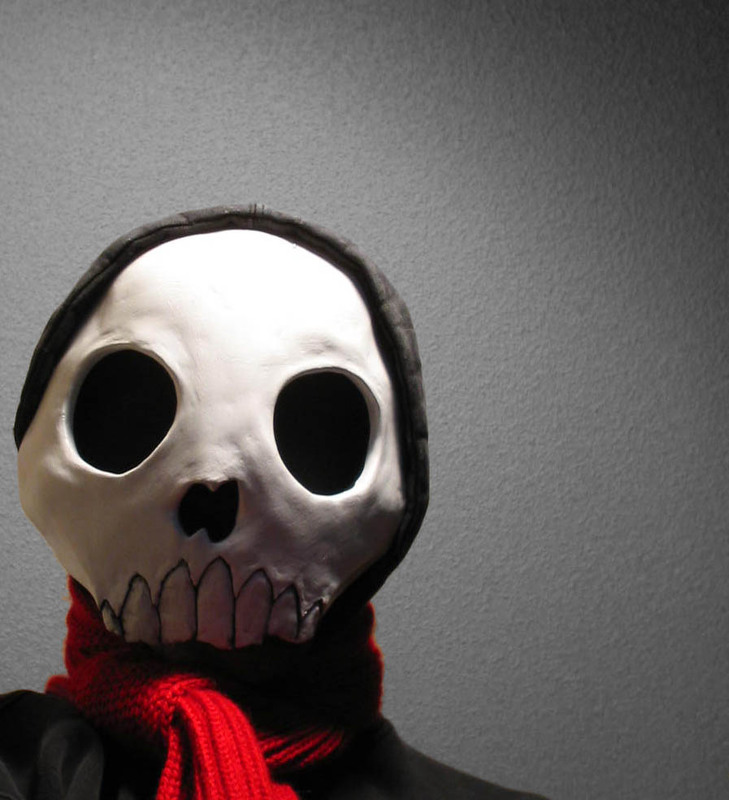 On the plus side somehow Benjamin Roman found my post of this mask on DeviantArt and gave me props for my work, small world. 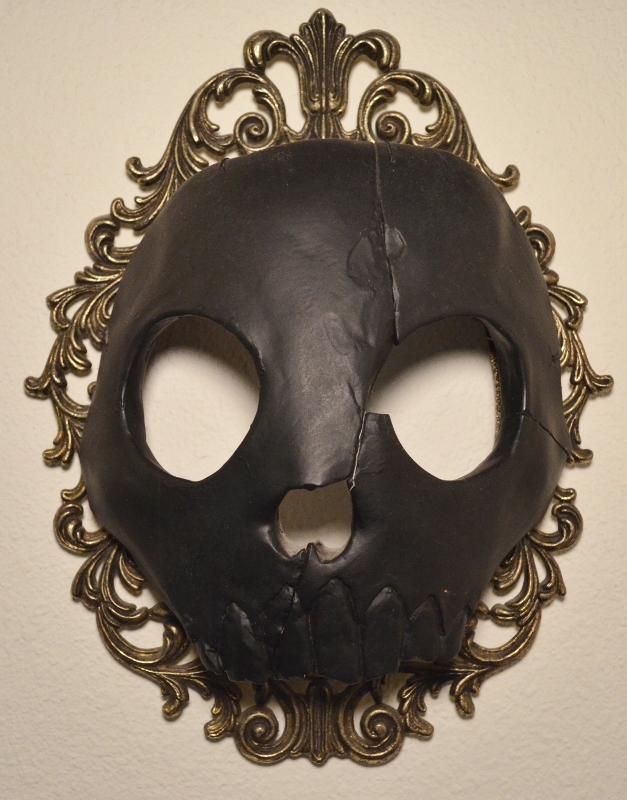 Sadly since the mask was made so thin it had a little accident and cracked so I made lemonade out of the situation by painting it and mounting it to an old frame and now its a nice piece of wall art. 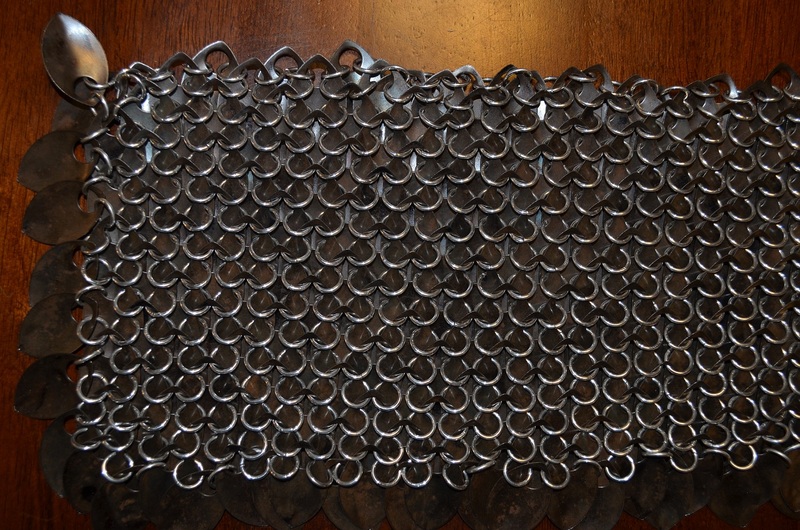 When someone asks you what you did over the weekend probably one of the most nerdy responses you could muster would be “I made chainmail!”. 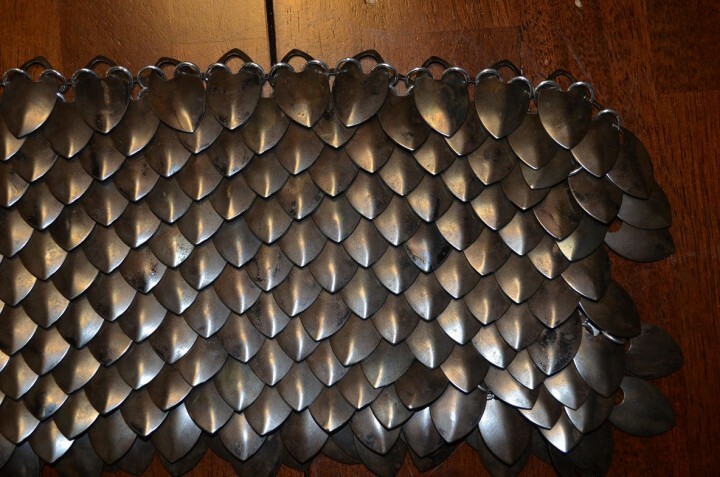 To have a connection in our costume theme both Sara and I are incorporating scalemail. 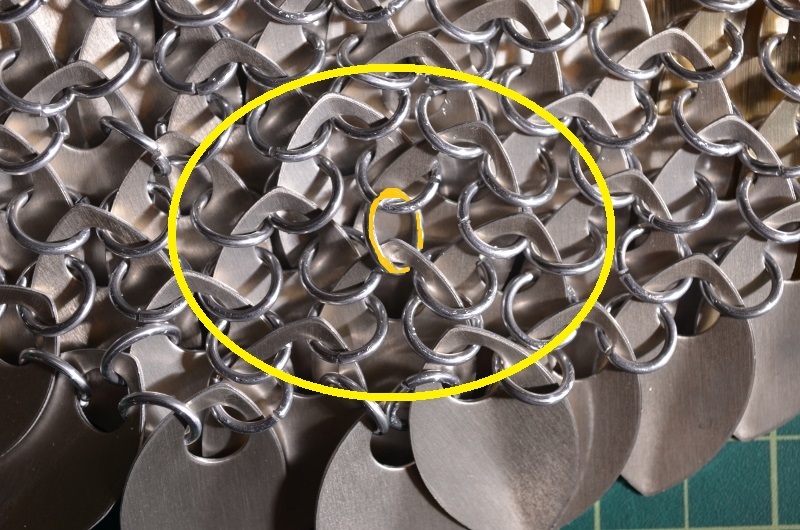 I chose the larger sized tempered high carbon steel scales from The Ring Lord. 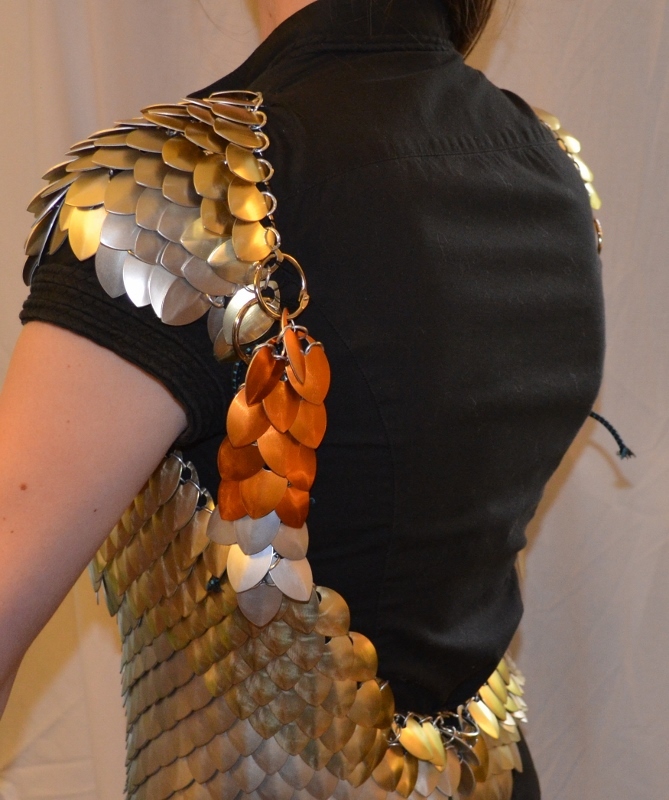 I wanted a more worn look “Authentic battle Damage!”, which I felt would be a good contrasting look when compare to the cleaner look Sara’s scalemail dress will have, which would more reflect a guy who’s been out in the world gaining his experience points and getting beat up from time to time. The pattern is the basic one also shown on the websites tutorial videos. The process is surprisingly easy but rather time intensive. I found that using a towel as a work surface keeps the area clean but most importantly it as a bit a friction so that all the scales you just assembled aren’t constantly shifting and slipping around while your working. I use two mini cheap pliers simultaneously to handle all the ring bending and scale handling. I find the smaller pliers allow me to still use my free fingers to grab stuff while not having to constant set them down. After a couple of after work assembly sessions I got most of a full sheet done. At this point I just need to repeat this process to get one more strip of scales. The next big step is to work through the best method of attaching the two together and the system that the final assembly will attach to so that this can be worn. 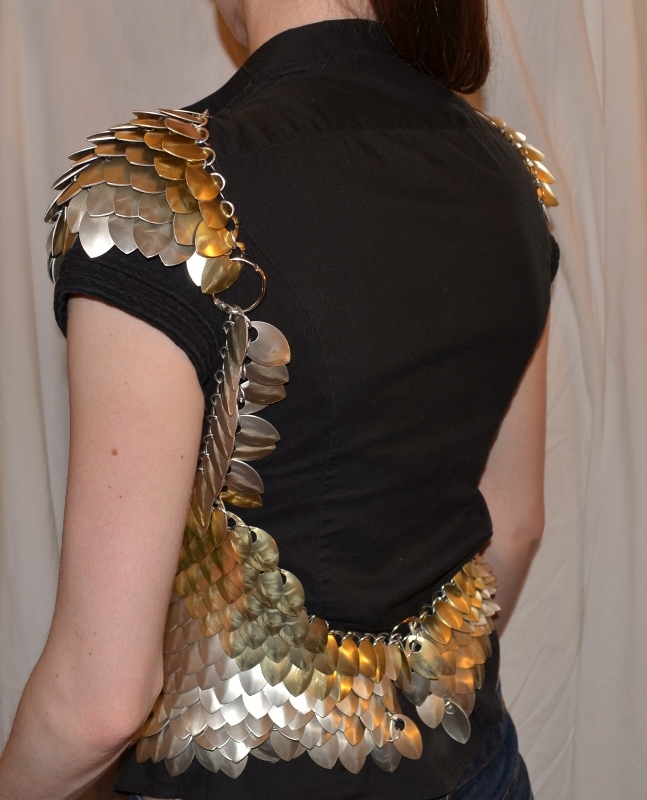 Attaching the scalemail to your body is usually fairly straight forward; you make a enough scalemail until you have a shirt shape then you just throw it on and bind up whatever side you left open since this stuff allows no stretch. For my plan I’m only applying scalemail to the lower torso, between the sternum and hipbones as you can see in my concept sketch.